Carlos Saliente is the exclusive SolarVenti dealer from Sorbas to Puerta Lumbreras. 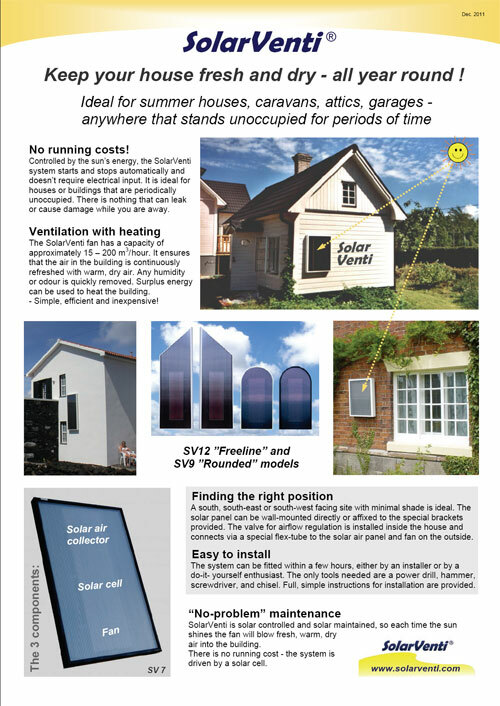 We can supply and install SolarVenti products, or supply only for DIY install, or offer Trade supply. Keep your house fresh and dry - all year round! SolarVenti is a solar-powered dehumidifier/ventilator which sends free, dry, warm air into a building. The system is free to run and is not connected to the main electricity supply. It is supplied with electricity via a solar cell. 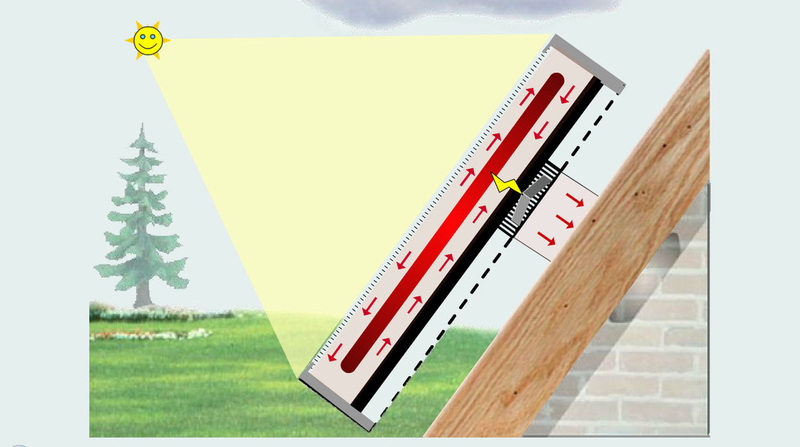 When the sun shines, it warms up the air in the absorber and the integrated solar cell produces electricity for the built-in fan - which blows the heated air into the house. Fresh air from outside is pulled in through a perforated back plate and a 2mm layer of felt. The air velocity is so low that only extremely small amounts of dust, pollen etc. are drawn into the system. When the system is running, air flow remains inside the panel. When the system is switched off, it cools itself down – even if there is bright sunshine. The heat rises inside the solar panel and exits via the felt and the back plate. No, the air is filtered through the felt. The felt cannot get clogged as the air is drawn into the absorber through the whole of the rear of the panel. A special filter can be used if you wish to filter the air more. What is SolarVenti’s primary purpose? Its main task is to dehumidify and ventilate a house. The aim is to improve the quality of the air and lower humidity. This makes a house better to live in and the air easier to warm up. 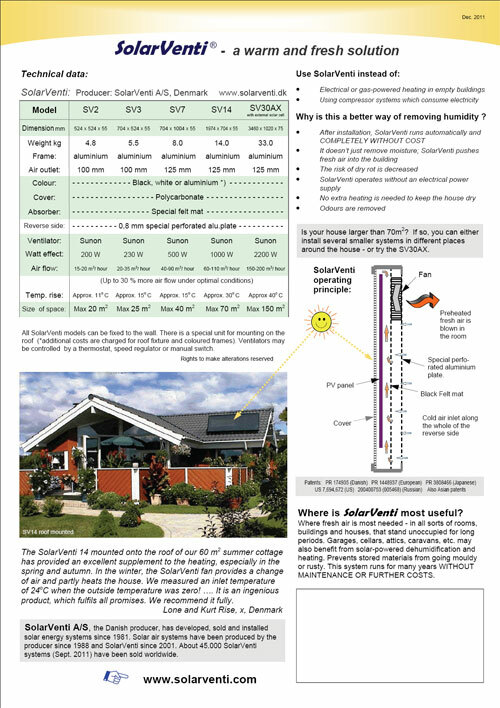 In many cases, SolarVenti will result in significant savings in heating bills. Why is this a better way of removing humidity? Where is SolarVenti most useful? or rusty. This system runs for many years without maintenance or further costs. Carlos Saliente is the exclusive SolarVenti dealer from Sorbas to Puerta Lumbreras.